Reprinted from an article in July 2008. A good family historian is possessed of a curious nature. We want answers to many questions. What did our ancestors look like, sound like, how did they live? More than "just the facts" we want to know the whole story, as much as we can possibly gather. Possessing that curiosity, I've begun collecting my ancestors' autographs or in some cases their mark. In writing my family history I have taken those signatures and placed them together on a page identifying the signer and their place in my family tree. 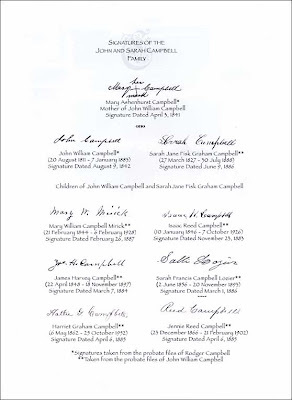 The signatures displayed here are of the John and Sarah Graham Campbell family. John and Sarah are my Great Great Grandparents. When you see the signature of my Great Grandfather Isaac Reed Campbell, try to reconcile this neat precise handwriting with the man I wrote about in The Tale Is Here To Tell. I have listed where I obtained the signature and the date the signature was made, as well as, the date of birth and death for the signer. My family has enjoyed this addition, this small detail, this curiosity to our written family history. I hope you enjoy it. Select the photograph to view a larger version of the page from my family history. Any spots or marks I removed with the clone tool. 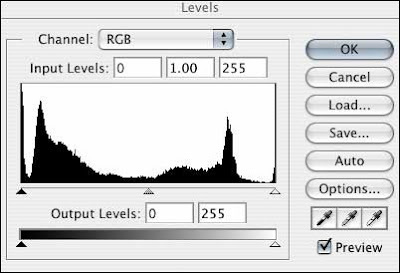 I saved each signature as a JPEG file. Note: I also kept each signature at the same width and height, making it easy to drop and center in the document. Then using Word for the Mac I created the document and dropped the signatures into place. Really very easy to do. Thanks for asking. I loved this post the first time! So much that it's been on my mind since that I want to do this for my ancestors, too. I haven't gotten around to it yet, but thanks for the reminder. It's been added to my to-do list! I've been collecting signatures for years. I love doing it. It's also interesting to read up on handwriting and personality. What a great idea; and you make it sound east, too! I am going to be looking at Arline's letters with an eye to autograph hunting from now on. What a fun post! I also have several ancestor's signatures and for a Christmas gift I had Paula Sassi analyze the writing of my husband's G-G-Grandfather. It was fascinating to compare her analysis with the information we'd gathered on this person. For anyone who is interested I'd recommend having Paula do an analysis. It was very interesting to say the least. That is such a great idea. Thanks footnoteMaven!! What a wonderful idea, fM!! I hope you don't mind if I steal it? I love to find a signature of an ancestor. Now I know what to do with it! What a great idea! I am assuming since you posted it you will not mind that we, you faithful and devoted readers, use it in our own genealogy work? Take Me! Take Me! I Volunteer!